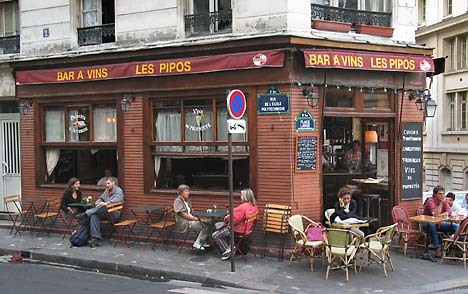 We just visited a well located wine bar, Les Pipos in the 5 th arrondissement . It is close to the Pantheon and to Rue des Ecoles & Boulevard Saint Germain , and it is also close to Rue Mouffetard . Closest subway stations are Maubert Mutualite and also Cardinal Lemoine . Exact location is rue de l'Ecole Polytechnique and rue de la Montagne Sainte Genevieve . Phone is 01 43 54 11 40 . 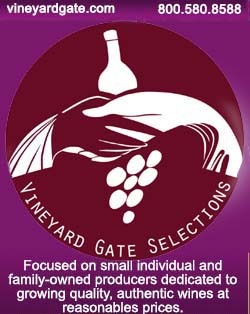 It is one of the old guard wine bars : Authentic, simple and very warmful and relaxed, with a selection of quality wines . A place you feel welcome to come in , and enjoy a glass of wine . The Montagne Sainte Genevieve neighbourhood is where Paris of the roman invasion and occupation (named Lutecia then) expanded from the original Ile de la Cite and Ile Saint Louis city limits . Montagne means hill : You indeed walk up when you come from rue des Ecoles . When you arrive at the wine bar at the corner ( right hand ) you are on a sort of square , with several attractive cafes and restaurants . 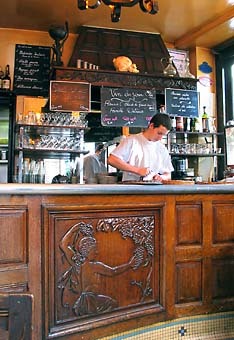 The bar is an old looking parisian bar , probably like many bars and bistros looked like 60 years ago . Wood , mosaic floor , period furniture . The building itself is "classé monument historique", wich means it has some historic importance and will be preserved; any restoration having to respect strict rules . Staff and manager are friendly . 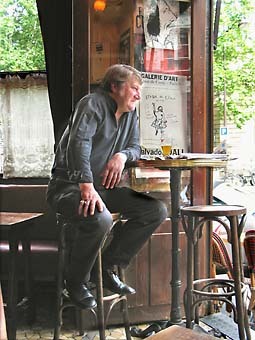 We decided to sit at a table inside, near the window open on rue de l'Ecole Polytechnique. From there you view the counter, the wood panelling, the wine list boards, listen to the jokes and also look at the street outside, wich is a quiet one . We devised about what to drink . 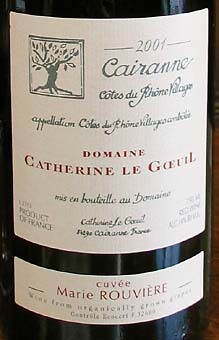 I took a red Cotes du Rhone villages Cairanne 2001 Domaine Catherine le Goeuil "cuvee marie rouviere" . 4,3 Euro a glass . B. chose a white : Menetou Salon 2003 Domaine de Chatenoy (by P. Clement) . 4,6 Euro a glass . I don't know if their other wines are that good or if we had chance in our choice , but we are both delighted with our wine . The Cairanne is a superb wine, round, rich . We are shown the bottle . It says "organically grown grapes" . 14° . I will look about where to find this wine in Paris . Later in the evening, I will browse the web and find out that this cuvee and year from Domaine Catherine Le Goeuil is made mostly from old vine Grenache, plus a little of Syrah and Mourvedre . 40 years old vines with low yields resulting in this concentrated wine , I read . Looking at the counter and the whole place is a pleasure . Many pictures on the wall . Several , in black and white , of Serge Gainsbourg . I asked if he was a familiar of the bar , but the answer was not clear . B. says her Menetou Salon is very aromatic . Lots of residual sugar . Laburnum & acacia flowers . You can eat here light charcuterie plates also . They have different plates , like saucisson ,cheese , saucisse seche etc ... for 5 Euro each . We'll not eat here though ; B. looks on the Pariscope for a potential movie and she notices Fellini's 8 1/2 is showing at Action Ecoles movie theater close by . Just time to quietly finish our glass and we leave . Hello, really like this site. The photos are beautiful (though you say you are a photographer, so maybe that is to be expected), and the subject matter, drinking wine in France, is something I'm deeply interested in. I'll be back for more servings. Hey, that's Serge by the door. You don't say that the ambiance is terrific Friday nights, because of the music by Dany or José. 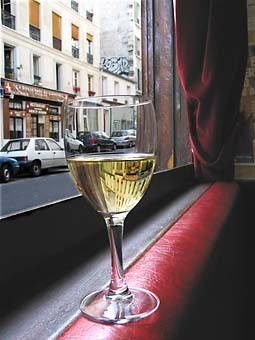 I love this wine bar and go there everytime I visit my friends in Paris. I will be going there soon September 30th. It's a great place to meet with my Parisian friends and talk. The staff and owners are very friendly. I had heard good things about this place and really wanted to try it, but I have to say we were all disappointed - the service was unfriendly and we distinctly got the feeling we were not wanted. Great place. We always go there when visiting Paris. Simple. Great location to sit and watch folks stroll by.